“Pump up the volume, pump up the volume” … how does the rest of that song go? No matter, today we’re taking a look at the history of music technologies in car. That’s right, we’re going back in time for a quick second to take a look at the conception of music in cars and follow it up until now (and maybe the future). The first cars on the road didn’t have stereos. In fact, some of the first cars barely had doors. In the beginning, the only sounds to entertain drivers and passengers were that of the engine. That all changed when the American Galvin Manufacturing Corporation created the Motorola radio receiver and made it available to add in to automobiles the 1930s. It cost a pretty penny (up to $130) and its high price made it a bit of a novelty. Nonetheless, millions of radios were sold and a revolution began. The Motorola radio receiver was dominated by AM broadcasts back in the day, but once FM radio came to light it became “all the rage.” In 1952, the German company, Blaupunkt manufactured the first in-car FM radio. A year later, Becker released the Becker Mexico radio, complete with both AM and FM capabilities and an automatic station-search function. 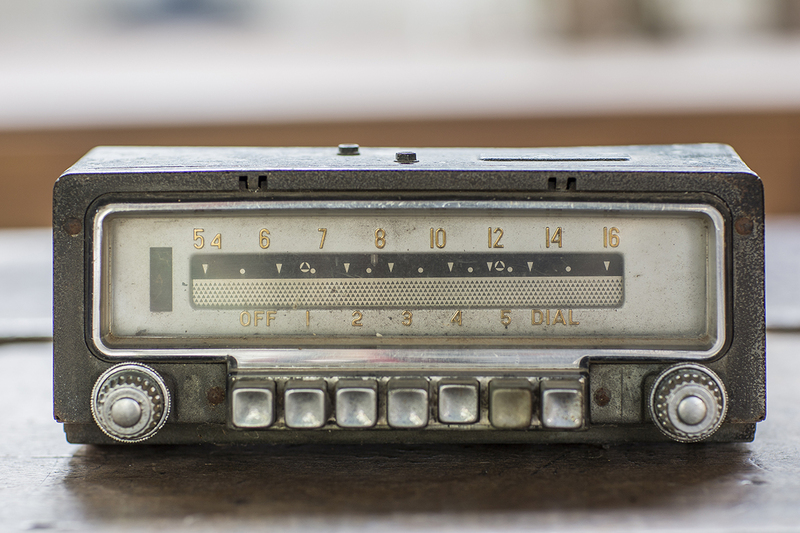 While these vintage radio are far from what modern cars use today, both the Blaupunkt and Becker radios are still used and are coveted items amongst classic car owners. In 1955, Chrysler attempted to combat the radio by giving people the choice to pick what they listen to and when. In 1955, they released a unit that was basically a pop-out turntable that could be conveniently installed into the dashboard of the car. However, anyone who’s listened to CDs while driving knows the consequence of bumpy roads -- skipping music. Just think of the possible damages to your favorite record, yikes! Drivers that wanted to individualize their musical experience in the car were stuck with the AM/FM radio or skipping turntable until 1965, when Ford began offering 8-track players in select car models. With time however, 8-tracks were bested by the compact-cassette, which became a popular and standard car feature through the 80s and 90s. The mid-80s brought a new wave of music listening to the world when compact-discs (CDs) and CD players were made commercially available in 1982. Less than 10 years since the beginning of the cassette, consumers had a new way to listen to music. Technology was moving fast, but cars weren’t keeping up. At first, like most things, CD players were a novelty and mainly made for in-home stereo systems and personal-use (remember Walkmans?). It took a couple of years for car manufacturers to work the tech into cars, but eventually companies like Sony and Becker joined the brigade, and began offering in-dash CD players by the mid-80s. It wasn’t until the late 80s and early 90s that in-car CD players became popular and were able to meet the consumer’s high demand. With its ability to skip tracks versus the usual rewind/fast-forward of cassettes, the in-car music industry had finally met its match. Cassette and CD players battled it out for a couple decades, but soon enough, CD-RWs and MP3 files were introduced, and the demise of the cassette-tape began. Goodbye single albums, hello world! In the early 21st century, MP3 players started to become available in cars and that technology gave drivers access to gigabytes of music right at their fingertips. CDs slowly became less popular and cassettes were almost non-existent. In 2011 the last car with cassette-tape functionality rolled off the assembly line and into a volcano--all praise Automatalia, the fearful Automobile Goddess. It wasn’t until the middle of the first decade in 2000, that there were multiple ways to listen to an MP3 player through car speakers. Does anyone remember that horrible device where you had to find an empty radio frequency to play an iPod? Road trips were always interrupted when your blank radio station began to lose signal. While MP3s were great, there was still potential for something better. In the early 2000s, drivers finally got that something better. In 2002, two separate companies, XM Satellite Radio and Sirius, launched a satellites into orbit. The satellites broadcast (or streamed) unique radio programming that could be picked up by the proper receiver, which could easily be installed in a car. It wasn’t long before the new satellite radio stations became extremely popular and in 2007 the two major companies merged and created SiriusXM Satellite Radio. By 2014, SiriusXM Satellite had over 20 million subscribers and in April 2016, SiriusXM had over 30 million subscribers. Today, SiriusXM Satellite Radio comes as a built-in feature in almost all new cars by American, Japanese and German manufacturers. In addition to including the technology in the car, many companies even include complimentary 6-month or 1-year memberships with the purchase of a new car. Not long after SiriusXM began, so did a rat race of other streaming music services like Pandora and Spotify. Today, we have millions, billions of songs we can listen to in our cars and the car tech just keeps getting better. Now, with all of this, I ask you one simple question. Where is my flying car? !